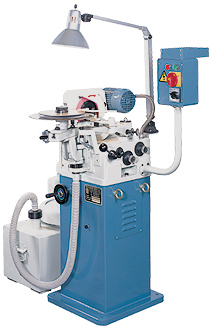 Now, GS presents the Circular Saw Blade Sharpener- the ultimate in sharpening machines. With quality construction, precision sharpening is simple and easy. Setup can be completed in just minutes. The elimination of time-consuming adjustment reduces labor costs. You can do your own sharpening economically and quickly right in your own shop, the way you prefer. It increases efficiency, as sawblades can be sharpened to exact specifications without delay. All cast components, except for those made of aluminum, are made from ductile iron. Simplified design, easy operation, and precision built for years of accurate sharpening work. Alternative high/low teeth can be sharpened in only one pass. The tooth height difference is varied and shown on the indicator, for perfect sawblade sharpening. Quick set cutting angle saves valuable set-up time so that sharpening is done quickly. Blade thickness is quickly adjusted and can be read on indicator meter. Tooth chamfering is easily performed, without need to replace grinding wheel. Economical, efficient and simple construction. Drive assembly is a simple combination of driving motor and cam drive motor, providing dependable feeding and trouble-fee operation. Micrometric adjustment for pitch and depth of teeth. Variable speed pulley affords a complete range of feed from 45 to 180 teeth per minute. Positioner pawl is tungsten carbide tipped for longer wear, and offers accurate feeding. Tilt the grinding wheel head upward for chamfering upper side. Tilt the grinding wheel head downward for chamfering lower side. Grinding wheel speed 4,500 R.P.M.